When the owners of the Chalupas Mexican Restaurant in North Vernon began to notice stained ceiling tiles in the dining room and small puddles of water on the floor of the kitchen after heavy rain they grew concerned. The restaurant owner made several trips to the roof to see what he could find but everything seemed in order. It was confusing because the leaks continued to get worse but the the flat roofing looked fine. After some time the owners knew something had to be done and that’s when the called Exterior Pro Roofing. 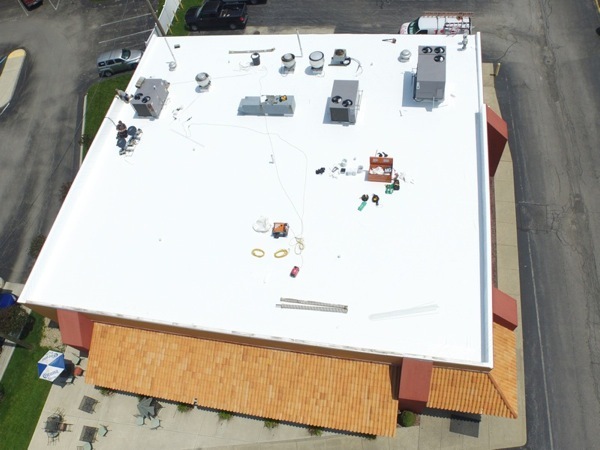 The existing roof was a white rubberized PVC (polyvinyl chloride) membrane and it had served the restaurant well. All the flashings were in tact and the metal copping was secure. The membrane had be ran up and over the parapet wall so there was no termination bar to come loose or separate allowing water to enter. 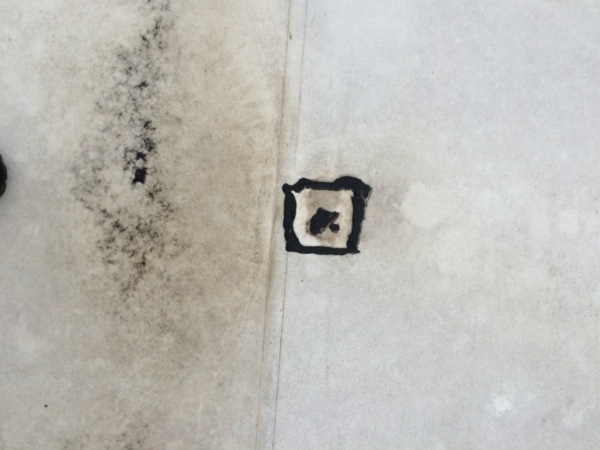 A quick visual inspection of the flat roof didn't reveal much but upon taking a closer look we were able to locate the problem with the flat roof, it was hail damage. Many folks understand how large hail can damage roof shingles because of recent storms in southern Indiana but hail damage can also occur on flat roofs. The major difference between hail damage on shingle roofs and hail damage on flat roofs is that problems in the flat roof don’t usually appear for some time after the hail damage has happened. Whereas, shingle roofs damage by hail show the immediate damage. When flat roofs are hit with larger, wind driven hail the impact fractures the membrane but this often isn't enough to cause a leak. However, over time moisture infiltrates the hair line cracks and then through freeze - thaw cycle, opens the crack in the membrane enough that water can begin to seep through and leak into the building. This is exactly what happened to the flat roof at Chalupas Mexican Restaurant in North Vernon, Indiana. These images show the owners best attempt to fix the flat roof but they could never get it to stop leaking. 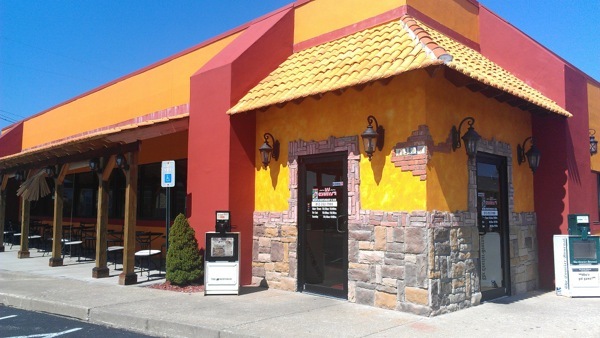 The Chalupas Mexican Restaurant was in a great spot for flat roof repair. On one hand they did have leaks and had to have the flat roof fixed but on the other hand the roof’s insulation had not become saturated and was still salvageable. 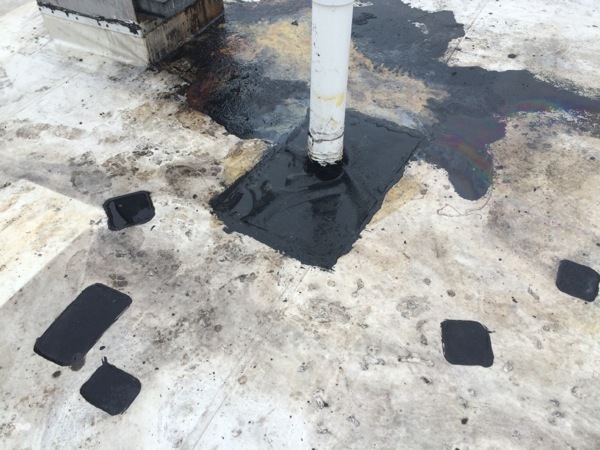 The restaurant roof was able to be recovered by Exterior Pro’s Flat roofing membrane. Our PVC roofing membrane, weighing in only a 1/4 per sq. ft. is designed to be used a recovery flat roofing system. This saves time, cost, and disruption of full flat roof tear off. Once we had the new material hoisted to the roof we began work by installing a separate sheet between the old, hail damaged flat roof and the new roof flat roofing membrane. Next, we removed all the old flashing around the HVAC curbs and around the pipes coming through the roof. Then, we removed all the old coping cap. With the roof prepped and ready we began our new flat roof installation. Then, the entire process took just three days from start to finish with a 4 man crew. We installed all new flashings and ran our new PVC membrane up and over the parapet walls. Finally, we set a new burnt orange coping cap that really goes with the mexican restaurant facade. After some clean up and taking our tools and generators off the roof the project was finished. The Chalupas Mexican Restaurant was back in action and ready to feed the hungry folks of North vernon, Indiana.